“Shutdown Bangkok” and the end of the “Good Old Days”? Drama queen! The shops didn’t look closed to me. He refused to drive us past the tail end of a road block and we had to walk to our hotel from there. (ahh, shame, I hear you say) We’re staying here because it’s very close to the shopping mall where we always come to buy silk, but it’s also plum in the commercial centre of the city and so very close to one of the “Shutdown” sites. 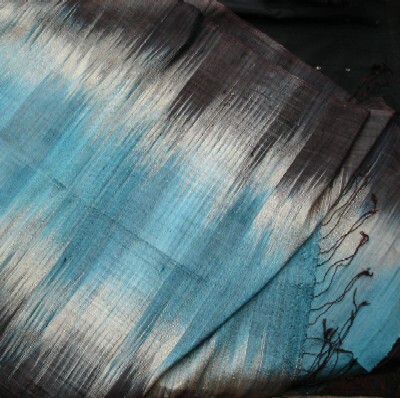 In the “good old days” we used to buy from the stalls in the basement of a department store called Narayan Phand where we could get Burmese sequinned embroideries, textile hangers made from old loom parts, hand made paper notebooks, jackets made from soft and subtle antique silk ikat, and wide luxurious shawls of thick slubby silk. After many years of it being threatened, finally everyone was moved out to the Pratunam Centre a block away, and the building has been turned into a Big C Supermarket. Shopping at the new Pratunam Centre wasn’t so good; some of the old stall holders had decided to call it a day but our old suppliers Royal Thai Silk, Koreena and Marie Silk were still there amongst the mass produced fashion wholesalers. We stayed faithful, popping in on our Bangkok transit days and loading scarves and jackets into rucksacks before getting the plane home or dragging big grey plastic bags to the post office. Now just to confuse and disorientate us Pratunam has had a facelift and changed its name to the Palladium Centre, but we track it down eventually through the road blocks. All this “shutdown” seems to have affected more than the traffic: the weather has gone all pleasant and the Big Mango is positively cool! I’m just not used to fresh air in Bangkok – where’s that heavy humid heat that should descend on you whenever you move out into the street? There are still a few familiar faces around at the Palladium but nearly everyone seems to be suffering from “customer fatigue” or is it “shutdown grumpiness”? And the good stuff is just not there any more. It’s now well nigh impossible to find decent jackets in the old “mutmi” ikat silk. I admit it was always a trial to sift through the rails – a lovely fabric would catch the eye but be ruined by the awful garment it was made into – with superfluous frills or horrid rosettes or a daft collar. But now that the silk fabric has become so rare, these abominations seem like sacrilege. However there’s still some nice fabrics to find if you dig around and we are encouraged by a small pile of beautiful ikat scarves. We probably buy more and pay more than we should, but these may be the last and it seems silly to walk away from them. Shopping done, we can take in a bit of “protest tourism” and wander up familiar roads made totally strange by the absence of cars, the pop up tents and the crowds of makeshift stalls selling “Shutdown Bangkok” accoutrements. 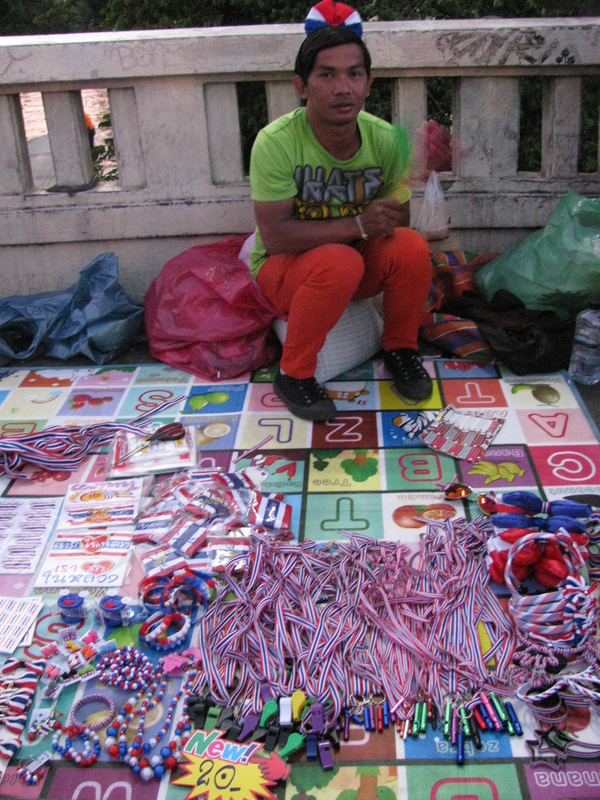 The Thais do love an excuse to set up a market and here’s another one – protest whistles, plastic clappy hands, hats, headbands, flags, armbands, and t-shirts by the thousand, all in the blue, white a red of the Thai national flag and the protesters, colours. I very much doubt the “Occupy London” campaign got their merchandising act together as fast as this. 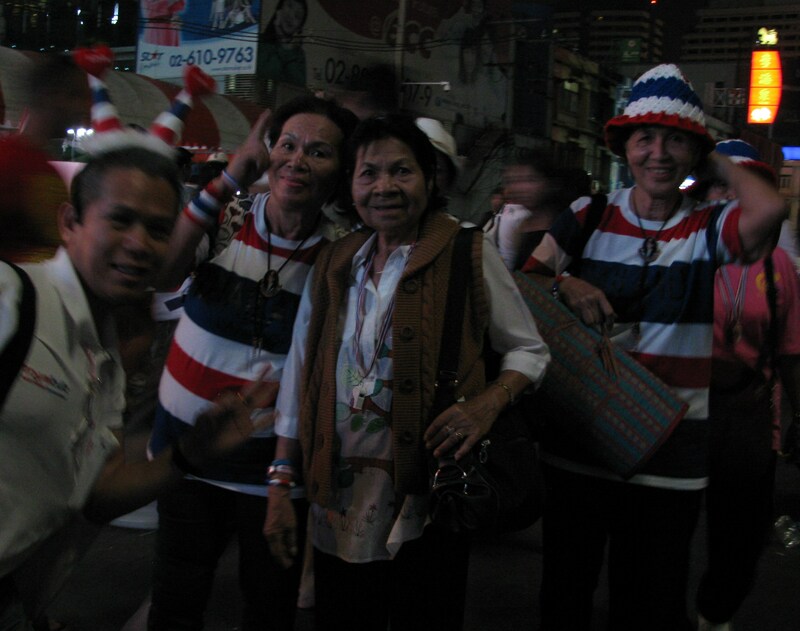 We wander through peaceful scenes of elderly ladies kipping down in see-through pop-up tents, protesters sitting on plastic mats and eating at canopied canteens, and past the big screens showing a live relay of the speakers on a big stage set up near the Erawan junction ahead. When we get there I am delighted to see that “Gaysorn Plaza” has been forced to close. It’s one of my least favourite “shopping malls”, not just because of its crap name but for the soulless international rich-git brand name shops in it. Now it’s had to close because there is a bloody great stage right in front of it and revolution or at least reform is being spouted outside its very doors. Ha! The mood is light and totally non-threatening. The protesters themselves are serious and determined, but others seem to be there for the crack, to see what the fuss is about, to buy a T shirt or blow a whistle and cheer the speeches. Strangest of all; there is not a copper or a soldier to be seen anywhere. At all. How long is it going to last? How long can anti government protesters just set up camp at key road junctions in the centre of a capital city without the baton charges, water cannon, tear gas or rubber bullets which would ensue in London, Beijing, Istanbul, or Cairo, or indeed the all-out brutality which has been the response to anti Government protest in Syria, Libya, Burma and Bahrain? In Thailand it seems the famous tolerance and laid back approach extends to civil disobedience too. At least for the time being.